It saves the image as a text file containing the pixel RGBA information in numeric format. Wha...? Numeric formats include decimal, hex (uppercase and lowercase) and binary. The delimiters can be comma, period or space. 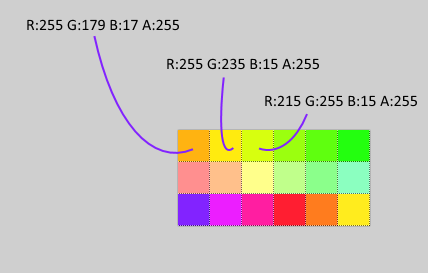 The pixels data has several formats (RGB, RGBA, BGR, BGRA....,). If anyone has a specific need of an unsupported sequence let me know and I'll consider it. The individual color channels can also be separated (the specified delimiter is placed between them). This plugin will save only. There is no load. To install the plugin, download my Plugin Pack and unzip it. Run the *.exe installer (written by BoltBait). Restart paint.net. Usage: The filetype shows up in the Save As... dialog. I wrote this to extract some custom 256 item palettes from an image which was (you guessed it) 256 pixels high. I hope you find it useful. Nice, I'll add this to my Hex editing tools. If you don't mind, I'm borrowing your Instructions for my post. Thanks TR! Feel free to borrow at will. I've completely FAILED to thank both you and Red Ochre for your help in testing this plugin. I really do appreciate the assistance. to avoid that the preview shows 'Computing' forever. Great suggestion Midora. I'll add that. Thanks! Updated to add Midora's suggestion above. File size shows the correct file size. 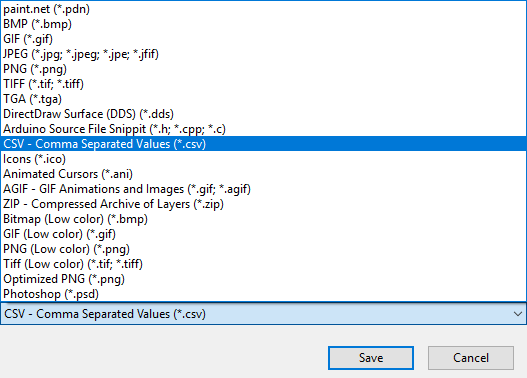 @Midora: Why not add IsReflexive to your filetype template? You are absolutely right that their should be an update of the PropertyBasedEffect and FileType template. There are still some proposal from Red and you open. Any possibility to include all orders of color components, like GRB and others? 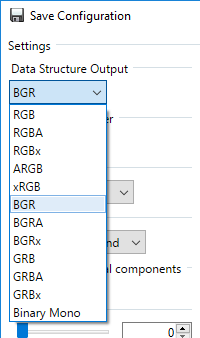 Also, include an x component; RGBx; where x is zero? X is the average color on another layer? I guess I could just select RGBA and make sure alpha is set to the level I need before saving. Why you may ask? NeoPixel buffers for Arduino projects so the image is stored in code. NeoPixels (or similar one wire bus protocol smart LEDs) come in many different color element patterns, and being able to store a native format is faster to copy to the output buffer. Further, the newer ones include a W channel that is for a forth White color element on the pixel. I'm short of time until this weekend, so I'll work on it then. I'll add GRB. Any other channel orders would you like? 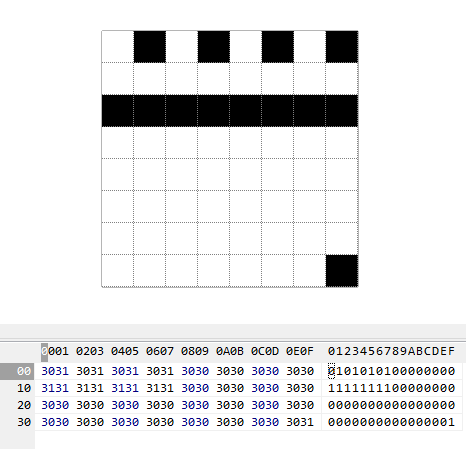 RE: x I'll add this too - it will be an 8-bit integer you can specify. Which format(s) would you like it for - just RGBx? 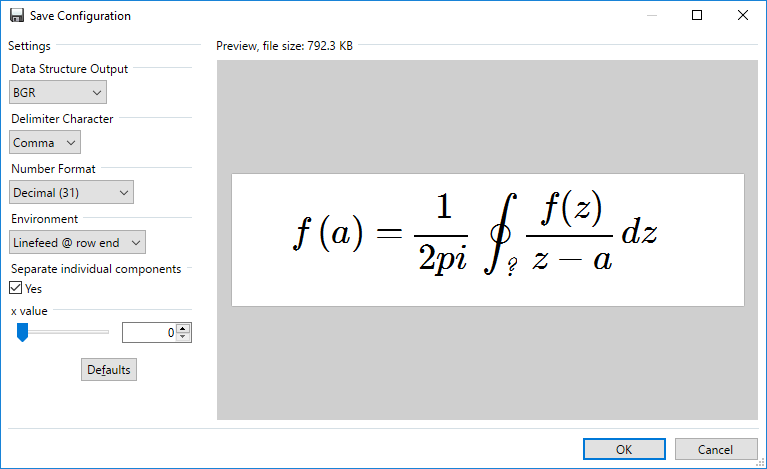 Where the x value is specified using the integer slider. Combined, these two options give you a monochrome 1-bit output where white outputs zero and any other color outputs 1. If you want the values the other way around, convert the image to Black and White and invert the colors (Ctrl+Shift+I).